﻿Bruce Goodman's "Save the tree!" SAVE THE TREE! SAVE THE TREE! chanted Colleen standing beneath a derelict, old, and rather dilapidated gum tree. The protest had raged for weeks. Years ago, a visiting celebrity had planted an Australian gum. It was to commemorate the union between the two countries; Australian troops had fought alongside local troops in some forgotten war. 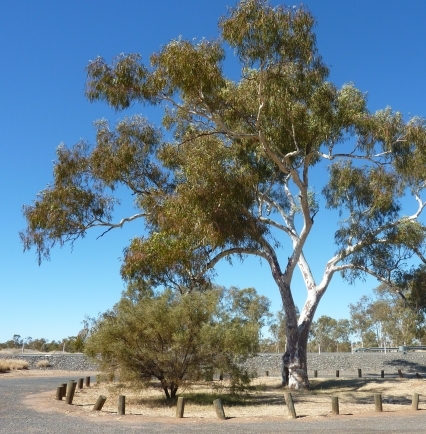 The gum tree was planted ceremoniously in the park. And now the town council wanted it removed. The village had grown over the years. The road out of town had been straightened and widened. There was still a dangerous curve. The gum tree was in the way. It had to go to make way for progress. SAVE THE TREE! SAVE THE TREE! chanted Colleen and her friends. Colleen even enlisted the help of her fourteen grandchildren. That certainly swelled the numbers! The dreaded day arrived. There is an almost iconic photograph (forget the man in front of the tank in Tiananmen Square) of Colleen standing, hands on hips, brazenly blocking the advancement of a bulldozer. And she won! She won! What a celebration! The tree was saved for the enjoyment of future generations! Anyway, to cut a long story short, a few months later a phone call came around eleven at night. Colleen’s grandson was killed in a car accident. His car hit a tree on a dangerous corner on the way out of town.